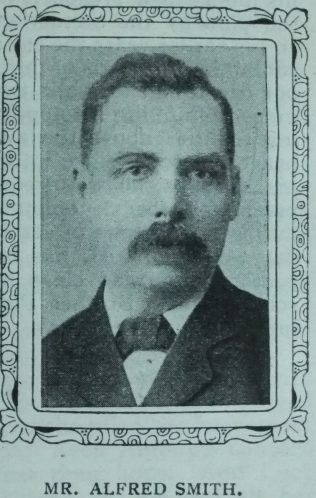 With the exception of two or three years of his youth, Mr. Smith has spent the whole of his life in Hull, and in connection with the Clowes Chapel and Sunday school. His father, Mr. J. Smith, though over eighty years of age, still takes a very active interest in that centre of religious life and work. It is over twenty-four years since Mr. A Smith was authorised to preach, and his subsequent progress and success have abundantly justified the selection then made. His development has been on the line of his own natural bent. He is a distinct type in thought, method and manner. He has read good, strong books. Ready-made sermons and pulpit crutches he has wisely eschewed. His sermons are fresh and dewy. Some people would regard his theological views as rather “broad.” He is eager to receive all obtainable light upon the Bible, and to apply its teaching to the life and needs of to-day. His sympathy with the evangelistic work and mission of our Church is intense and passionate. He has been schooled by an experience that would have broken a weak man to pieces, and from an oft-tried heart he preaches to the needs and perplexities of his hearers. He has rendered good service to his own Circuit, and to several of the rural Circuits in East Yorkshire and North Lincolnshire. He goes from home less now than formerly because the claims of Sunday school work press more heavily on him. In addition to his work among young people Mr. Smith leads a large society class. He is a loyal Primitive Methodist, a genial companion, and an earnest Christian. Being only in his fifty-fifth year we hope a long period of increasingly fruitful service still awaits him. I have not been able to unambiguously identify Alfred in Census returns. He was possibly born circa 1853 to parents Joseph and Mary and became a confectioner/baker. Can anyone point me in the right direction?